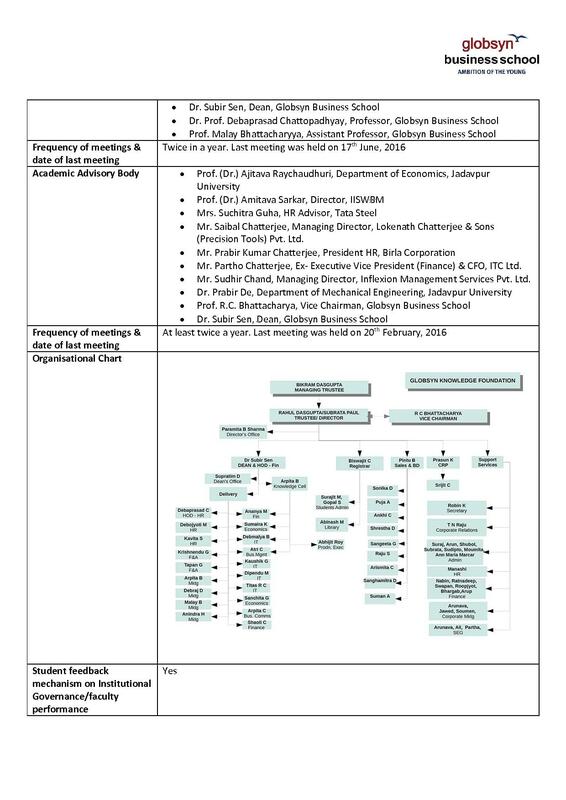 Globsyn Business School (GBS) is a Private B-School located in Kolkata, West Bengal and was established in the year 2002 by Globsyn Group. 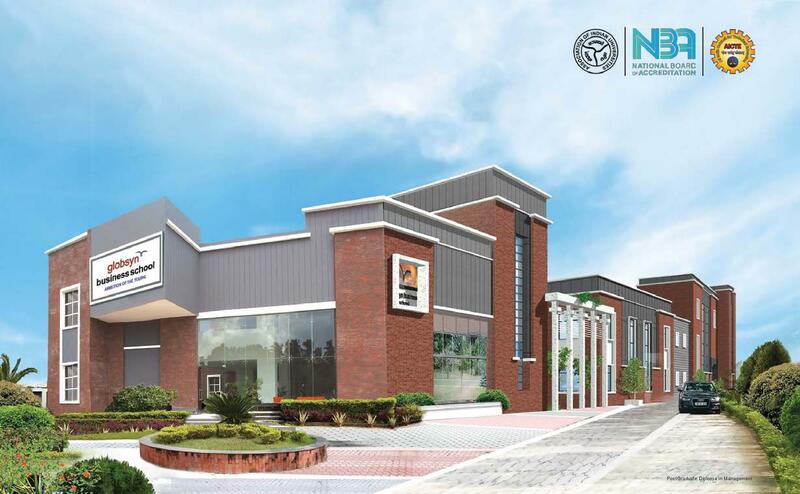 The Institute is recognized as India’s First Corporate B-School located in Kolkata and originated with the aim of blending together the infrastructure and institution. GBS is also approved by All India Council for Technical Education (AICTE) and is accredited by National Board of Accreditation (NBA). 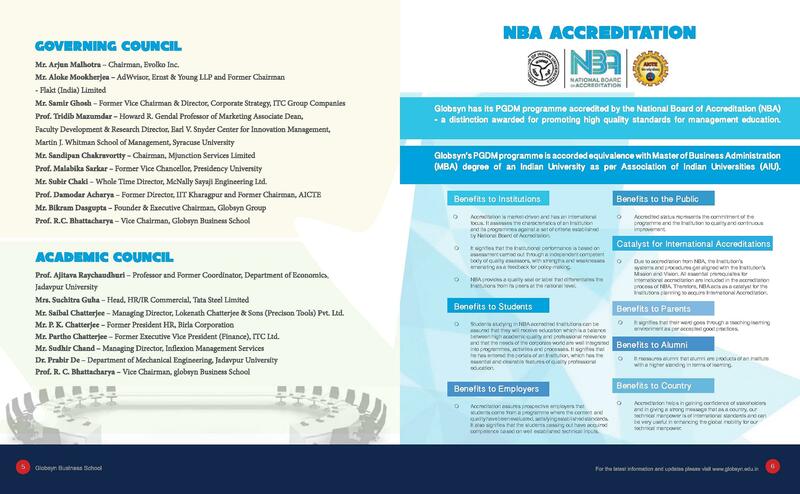 It is also a proud member of Association of Indian Universities (AIU). Courses offered by the Institute are PGPIB and PGDM. 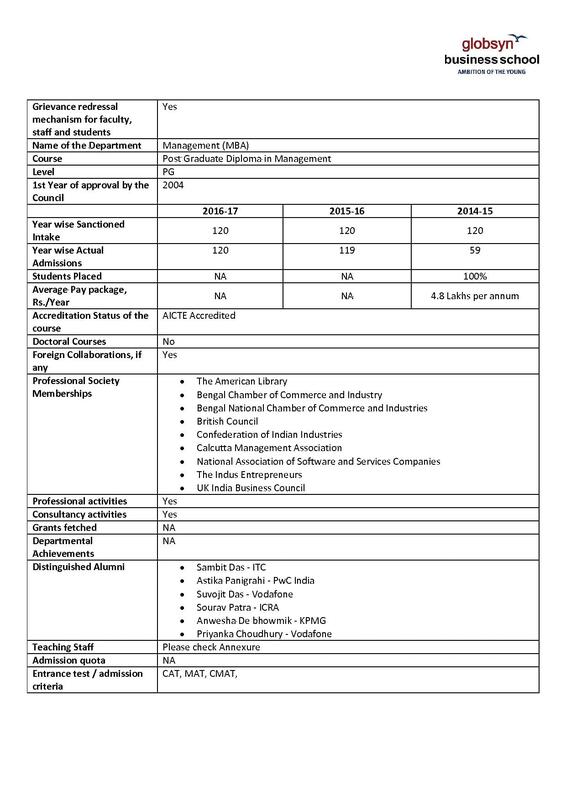 The Post Graduate Diploma in Management offered by GBS is AICTE approved and has equivalence to the MBA degree as per Association of Indian Universities (AIU). 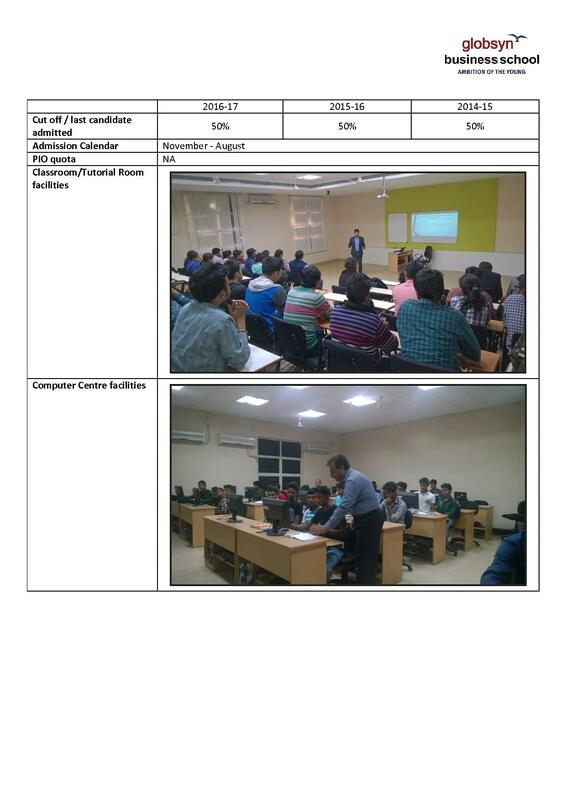 To secure a seat in PGDM program, the candidate must have done Graduation from recognized Institute/ University with minimum 50% marks in aggregate. Final Selection to the course will be done on the basis of Written Test (Essay Writing), Student Video Profiling/ Student Response Test, Group Discussion, Personal Interview and CAT/ MAT/ XAT/ CMAT Entrance Exam Score. Note: Management Entrance Test score doesn’t play a significant role in the admission process. The selection of candidate is done on the basis of his performance in all of the above-mentioned tests. This program is designed to provide global education and experience to the students and to provide an opportunity to study some portion of the program at Kuala Lumpur, Malaysia. GBS is affiliated to Lincoln University College, Malaysia. To get admission to PGPIB program, the candidate should be a graduate from Recognized Institute/ University and must have a valid score in XAT/ MAT/ CAT/ JEMAT Entrance Exam. The hard-work and efforts of the GBS Placement team has lead more than 450 organizations from various industry verticals like Automobiles, Advertising, Banking, Consultancy, Chemical & Paints, Consumer Durables, NBFCs, FMCG, Insurance, Hardware, Media and Retail to absorb the students of GBS, both during the final placements and the summer internship. Few of the domestic brands & large MNC visiting the campus for their recruitment drives are Citi Bank, Amazon, TOI Group, Loreal, Pepsico, Nielsen and E & Y.
Ranked among the Top 5 B-Schools in Eastern India as per the Best B-Schools Survey conducted by Business India in 2016. Ranked 48th as per the Best B-Schools Survey conducted by Business India in 2016. Conferred with the Gurukul Award for being the Best MBA College (Non IIM) during 2015-16. Won the National B-School Award in association with Canon according to Star News Channel in 2011. Awarded as ‘the Institute with Excellence in Infrastructure and Corporate Connections’ according to Higher Education Review. 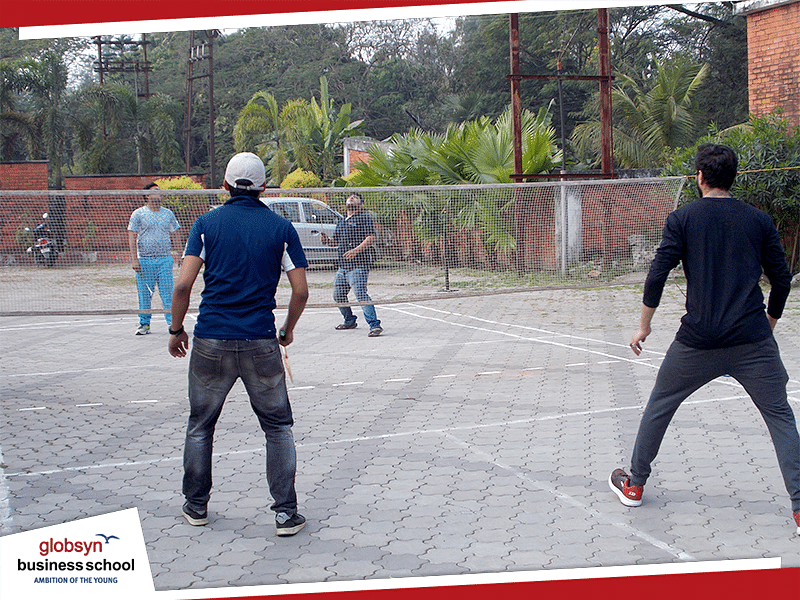 Nationally Awarded & Graded with CRISIL A** by CRISIL Business School Grading. Recognized as the Best B-school providing Human Resources (HR) specialization at the Human Resource Excellence Award organized by Genius Consultants Ltd. and The Times of India. Won the B-School Leadership Award by Dainik Bhaskar. 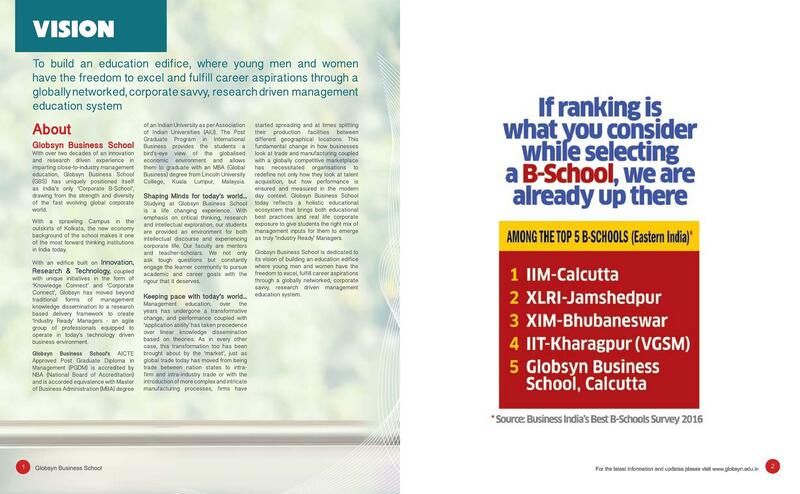 Rated No.1 Private B-School in Kolkata by several Business Magazines and Research Association. Globsyn Business School was the Winner for Entre Arena in 2016. Won the PWC SDC Kolkata Campus Connects 2016. Globsyn was declared as the Winner in Kolkata BRIO 2011, 2013 and 2015. Stood 2nd Position in Young Indians, Gan event organized by Confederation of Indian Industry in 2011-2012. GBS was declared as the 1st Runner Up of INFERNO 2010. GBS Stood Runner Up in the Management Day Debate Competition held in 2009. Declared as the ROOK-E-MARKETING GAME- Winner in 2009. Won the 'Best B-School using Technology in Training/ Education' award for two successive years. Why Choose Globsyn Business School (GBS)? Management Development Program: At GBS, the students are enriched with MDPs to bridge a gap between industry and academic learning. These programs develop managerial skills in the student. Corporate Connect: The corporate connect program is an important part of the curriculum at GBS. Experts from the industries are invited to share their practical experiences with students. Corporate connect conducts live projects and company visits for the students. Knowledge Connect: GBS has Knowledge Cell which works to blend teaching and learning. Knowledge cell holds industry-driven case studies for students and makes them learn constantly changing the environment. Global Exposure: GBS is affiliated to Lincoln University College, Kuala Lumpur, Malaysia. The students enrolled in PGPIB will get an opportunity to study at Malaysia University after the completion of the program. Student Loan: GBS has alliances with banks to facilitate loan facility to the students. Students can avail loan from SBI, Axis Bank, HDFC, Canara Bank and Syndicate Bank at easy interest rates. Globsyn Business School offers Kalyani Young Achievers Scholarship, an initiative of Kalyani (a Bikram Dasgupta Foundation). This scholarship is awarded to five meritorious students, who want to pursue the Post Graduate Diploma in Management (PGDM) at Globsyn Business School. An expert panel will select the eligible student on the basis of application through an interactive process which may include Group Discussion and Panel Interview. 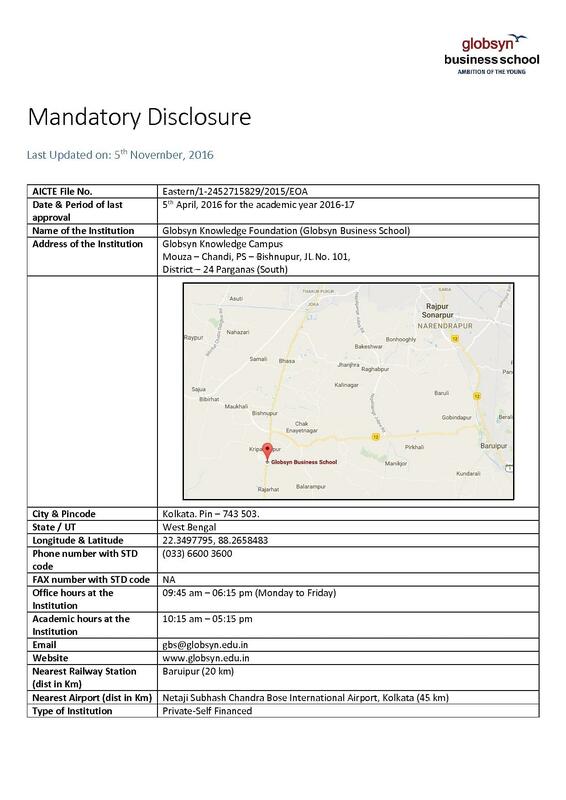 Under the Scholarship scheme, the academic fees of the selected students may be waived off proportionately (as per the discretion of the management). Note: A candidate must score 7.0 CGPA or above for all the 4 Semesters to continue to retain the Scholarship. Non-academic expenses like admission fee, transportation fee, and hostel accommodation fee are not included under the scholarship scheme. 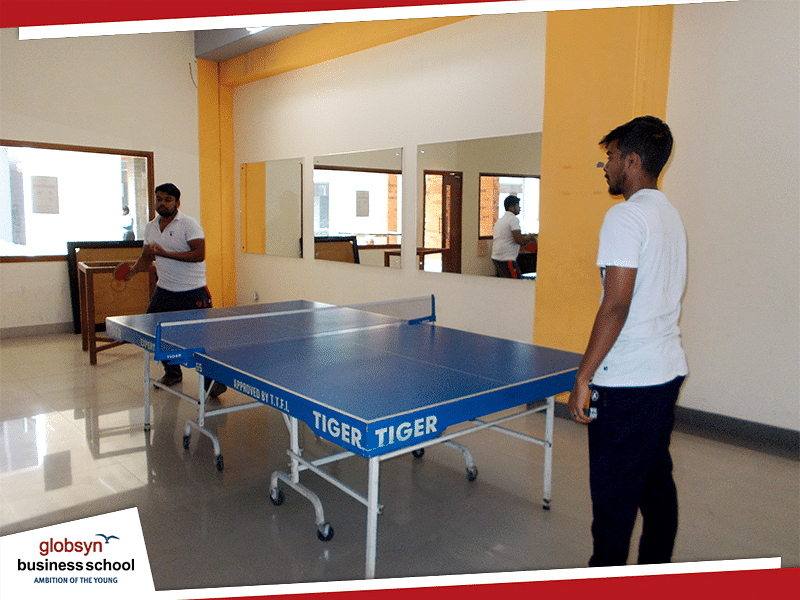 Overall, the college is a nice place to enhance one's personality and scope for learning and getting an experience in the concerned field. The faculty and management is quite supportive. The entrance procedure of Globsyn campus is quite easy. You are required to score 50 percent minimum marks in your class 12 to qualify for the admission procedure and graduation from any discipline. There is no additional exam. The entrance procedure of GBS, is quite easy. You are required to score 40 percent minimum marks in your graduation to qualify for the further admission procedure. The kolkata campus is one the best. 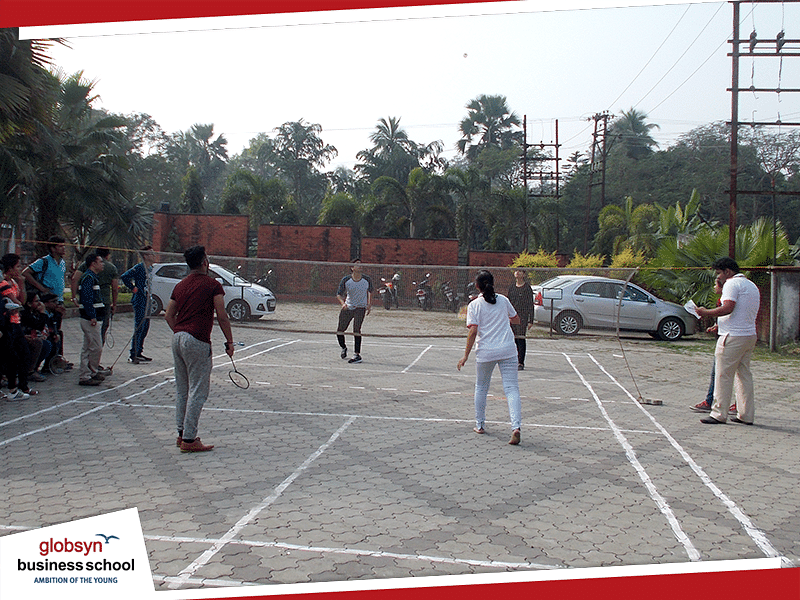 The entrance procedure for GBS, Kolkata takes place through a counselling by the college management. The student can be from any discipline of graduation ans requires to fill the application form.